Leading dissident republican Colin Duffy's arrest on IRA membership charges came after months of surveillance by a specialist police team investigating up to a dozen killings linked to both the PIRA and the IRA lead by Colin Duffy. 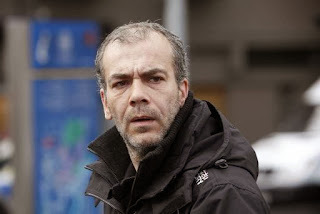 The Irish Observer can reveal that the unit was set up in the wake of the November 2012 killing of prison officer David Black by The IRA which Colin Duffy, 46, was arrested and questioned about. Since the M1 motorway shooting the Lurgan-based republican has been under 24-hour watch from the PSNI and MI5. And at least 12 PIRA related killings, some of which Duffy has previously been publicly connected to, are currently being re-examined by cops. These include the 1998 IRA abduction and killing of cigarette smuggler Kevin Conway in Aghalee. Last Wednesday Garyy Marshall, 45, appeared in Craigavon Magistrates' Court charged with killing Conway. The dad of four was shot dead because he tried to muscle-in on an PIRA illegal cigarette racket in Lurgan's Kilwilkie estate. Marshall — the man charged with the execution — is a close pal of Duffy, who was with his brother Sam Marshall when he was murdered by loyalists in 1990. Before freeing Gary Marshall on bail totalling £6,000 the court heard there was “new forensic evidence” linking him to the case. The specialist PSNI unit which has been monitoring Colin Duffy is still investigating him for the Conway killing. Experienced detectives drafted into the team have spent the past 12 months reviewing the original exhibits and forensic evidence. The fresh probe was sparked after last year’s exposure that Colin Duffy's name was all over Special Branch intelligence files that identified him as one of Conway's killers. The documents were made public during the inquiry into the 1999 murder of solicitor Rosemary Nelson by the LVF. The high-profile lawyer acted on behalf of Colin Duffy until she lost her life in a brutal car-bomb. One intelligence document written by detectives in 1998 about the Kevin Conway murder states: “Colin Duffy organised and participated in the abduction and murder”. Small-time criminal Conway was babysitting his 14-week-old son when he was taken from his home in Lurgan's fiercely republican Kilwilkie estate in February 1998. He was brought to a derelict building near Aghalee and blasted in the head. Because the horrific execution took place two months before the signing of the Good Friday Agreement anyone convicted of it will have to serve just two years in prison. A dozen other IRA killings that occurred between 1989 and 1997 are being re-examined by specialist cops who are also investigating Colin Duffy. A security source with knowledge of the Duffy surveillance team said: “He had become a creature of habit over the past number of months. “Sometimes he would stay overnight at addresses in the Ardoyne area and other times he would drive back to Lurgan. Our source explained how Colin Duffy would regularly use a park to meet with his closest friends. The insider added: “As a result, the PSNI, MI5 and SRS decided they needed to hear what he was talking about. “Up to a dozen high-powered listening devices were secretly planted overnight in the park. As well as mounting an unprecedented surveillance operation on Colin Duffy the specialist PSNI team probing his activities has also been looking at his friends. Among this group are former IRA blanket-man Alex McCrory, 52, and 45-year-old republican Harry Fitzsimmons. McCrory is often seen by Duffy's side and was photographed with him during a parade protest in Ardoyne last year. Riots broke out later that evening. He was also pictured with him during the summer at the funeral of Republican Sinn Fein and Continuity IRA Chief Ruairi O'Bradaigh. Last Tuesday McCrory and Fitzsimmons appeared in the dock of Belfast Magistrates' Court charged with attempting to murder members of the PSNI in a gun attack on the city's Crumlin Road earlier this month. They are also accused of possession of a gun with intent to endanger life. Along with Duffy, shaven-headed McCrory and Fitzsimmons are charged with conspiracy to possess firearms and explosives with intent to endanger life, conspiracy to murder and IRA membership. All three refused to stand-up during proceedings at Belfast Magistrates' Court and were remanded in custody. A new IRA assault rifle recovered by cops after a failed murder bid in north Belfast earlier this month was one of six smuggled into the North by The IRA. The Irish Observer can reveal that leaders of The IRA group recently purchased six ‘clean’ Kalashnikov-style weapons to use in a fresh campaign. The first time a gun from the batch was used was in Ardoyne on December 5 when a New IRA member opened fire on a police patrol travelling up the Crumlin Road. In his panic to escape he dropped the prized machine-gun which was later recovered by police. This blogger understands that a second Kalashnikov hidden in a house nearby was also discovered during follow-up searches. A security source said: “Intelligence indicates that the New IRA has recently acquired a batch of high-powered rifles to use in a new campaign. Belfast republicans Alex McCrory, 52, and Harry Fitzsimmons, 45, appeared in court last Tuesday charged with possessing the gun used in the December 5 Ardoyne attack. They were remanded in custody along with IRA Chief Colin Duffy, 46, who is accused of IRA membership and conspiracy to murder members of the security forces.